Okay, so maybe you're not a calculus whiz, but you still know that making an informed decision is all about paying attention to the numbers. Fashion may be a creative field, but that doesn't mean there's nothing to learn from the data available at our fingertips (ah, the beauty of the digital age). So with a new season upon us, odds are that you're considering the trends worthy of investing in for the coming months. 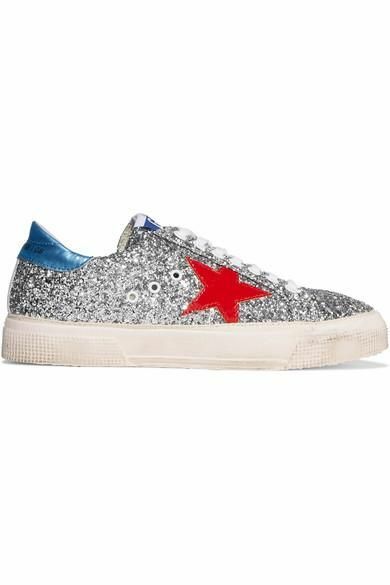 According to Pinterest, you should put embellished sneakers at the top of your list. The website shared the styles everyone is pinning this season, and searches for the bold sneakers are up a whopping 91% year over year. While it's no secret that we're fans of the classics, it's exciting to see these statement-making shoes rise through the ranks. Pair them with a simple pair of jeans and a tee, and you'll feel fancy instantly. Read on to shop a few of our favorites below. Are you a fan of the embellished sneaker trend? Let us know in the comments.